We want to hear your favorite packaging products and your tips for how you make your packaging special. Participants enter by commenting on Facebook with their favorite packaging product or tips. Additional entries may be gained by Tweeting or Instagraming packaging products or packaging tips with the hashtag #gemsondisplay and commenting on Facebook about these entries. Up to three entries per person. Facebook is in no way associated with this promotion and participants agree to release Facebook of all liability. Wrap it Up Contest begins October 22, 2013 and ends at midnight on November 11, 2013. Contest is only applicable to participants living within the 48 contiguous states who are 18 years of age and above. This contest is sponsored and promoted by Gems on Display. Sponsor and promoter address: Q473 Road 1 McCLure, OH 43534. We reserve the right to use participant names and contest entry for publicity purposes only; no other information will be recorded or used without authorization. Winner will be contacted at the end of contest for shipping information. Need some jewelry tray liners for those trays? We thought so. It can be challenging to know which liners you need for your trays (especially when there are so many options). To make it simple, we’re broken it down into four main categories of tray liners: Compartments, Gemstones, Liners and Pads, and Rings. 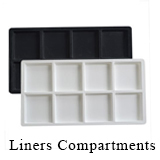 Compartment Liners— These liners come with anywhere from six to fifty vertical or horizontal compartments and can be used for a wide variety of products such as bracelets, necklace, beads, stones, and much more. The compartment liners are useful for both display and organization. Pro tip: Some of the compartment liners work especially well for specific display products; for example, the ten compartment tray liner (96-T1) fits the Glass Top Gemstone box (GB-0001) perfectly! Also, the 28 compartment liners are perfect for earring displays (item number BX565 fits right in there!). Gemstone liners— the acrylic gem jar liners are ideal for gems, beads, charms, lockets, and much more! 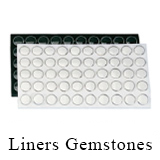 The gemstone liners are all the same dimensions, but have different sizes of jars depending on how many jars are in the liner. 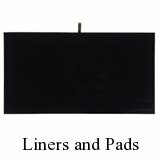 These liners range from 24-50 jars per liner for the full sized liners and 12 or 25 jars for the half-sized liners. The acrylic jars all have a foam insert, a pop on/off lid, and are set in a foam pad that comes in either white or black. Once placed in a jewelry tray, this makes for a fantastic display! Gemstone Liners also work for beads, charms, lockets, and more! Liners & Pads— excellent for an elegant and classic display. Velvet display liners are ideal for displaying, and a simple way to go from traveling to displaying without a extra hassle. Simply place your jewelry on the display pad or velvet liner in an attractive manner for an eye-catching display. 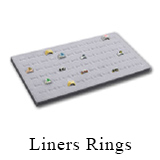 Rings— Ring liners are available in two types. Foam pads with ring inserts, or as tufted tray liners. These come in full size or half size liners, and have a few different color options. Pro tip: You can also use the ring liners to place on top of your jewelry in a tray to keep it from moving around during travel in a carrying cases. Remember: liners go inside trays to make a complete display. Full size liners will fit in full size trays, and half-sized liners will fit into half-sized trays.